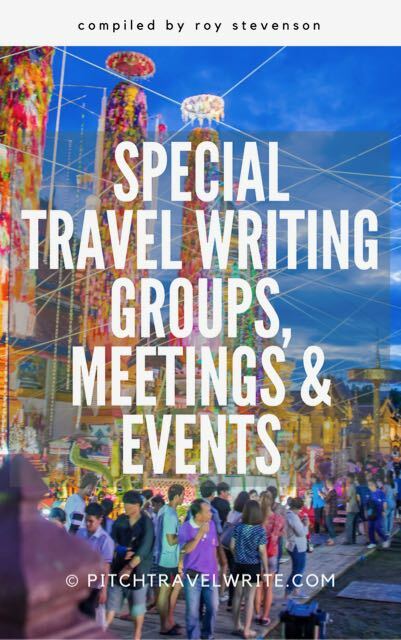 Get a jump start on your travel writing with these calendars of travel writing conferences, workshops and special events. Our lists include regional, national and international listings for both writers and bloggers. Travel journalists have a lot to gain by attending conferences and workshops. You can learn more about your craft and what’s happening in the industry and meet other writers – like you! And if you network with the right people at these events, you can easily make back your conference expenses and score some writing assignments and exciting press trips. Where Do You Find Travel Writing Conferences, Workshops and Special Events? Most professional travel writer’s organizations offer annual conferences. These range from regional and national to international events and cater to writers at all levels and of all stripes—from the novice to the well-published veteran. Travel writing workshops are offered online and all around the world, sometimes in exotic places. 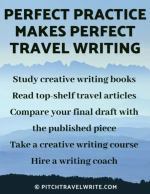 They’re focused on the craft of travel writing and on marketing your work. They’re for writers wanting to up their writing game, break into print magazines, and pitch the big league $1/word travel magazines. These conferences keep you updated on . . . These conferences also . . .
There’s nothing like a face-to-face meeting with DMO media reps or magazine editors to clinch a deal. I’ve met many Convention & Visitor’s Bureau media representatives who’ve invited me on press trips to their cities. 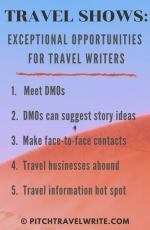 The advantage of meeting these DMO media reps face-to-face is that you can learn about their best tourist attractions and quickly match them up with your outlets, on the spot. Travel Media Showcase is one conference designed specifically for this purpose. Some writer’s conferences match writers up with magazine editors. Aside from hobnobbing socially with the editors, you get to introduce yourself and your outlets to them in 10-minute story pitch across the table, speed-dating style. These conferences help you score lucrative assignments, boost your magazine bylines, and help establish long-term relationships with editors. Travel Classics West is one conference designed specifically for this purpose. How Many Conferences & Workshops Should You Attend Each Year? 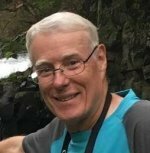 I’d suggest you attend at least one regional conference each year, plus a national or international one. Same goes for the workshops. If you can afford the time and money, investing in your craft by participating in a workshop or two each year will help you develop and benefit you in the long run. 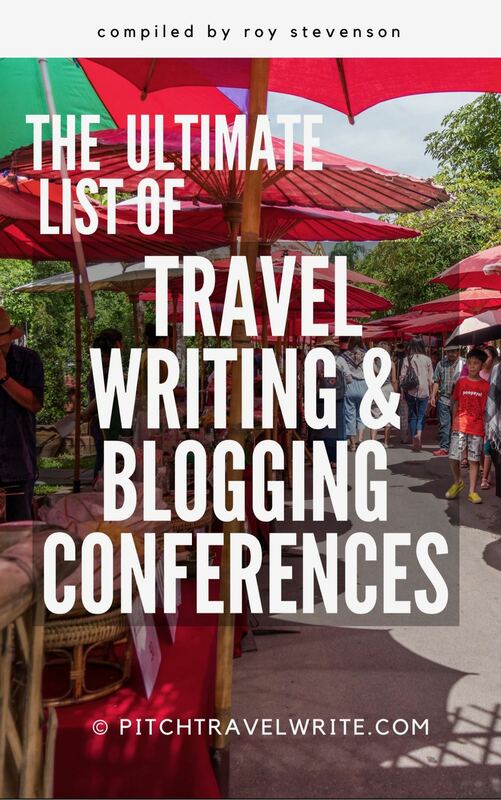 You may notice we haven’t included every conference for travel journalists and bloggers. And you won't find every writing workshop and special event on this list. We’ve only included the conferences and workshops with a reputation for providing good value and quality services to the attendees. By the same token, we can’t guarantee that any of the conferences and workshops on our list will live up to your expectations. Workshop and conference quality can vary from year to year, depending upon a multitude of variables. 1. Study the program in close detail before signing up. If there’s no agenda, request one. Don’t sign up until you see one. 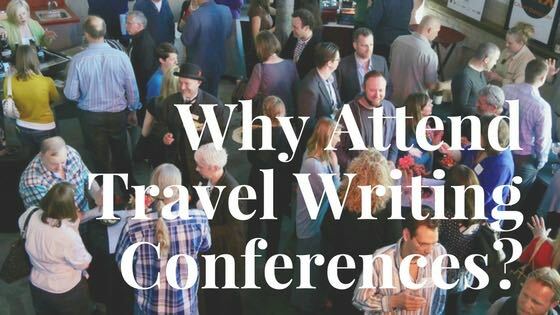 Some writing conferences are so general that they are of no practical use to freelance travel writers. Make sure the agenda lists topics that will be beneficial for your needs. 2. 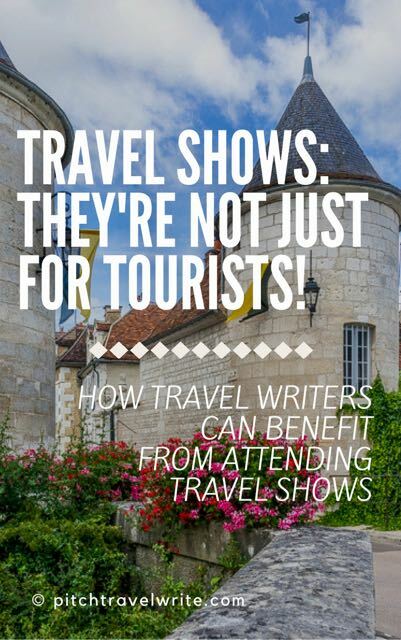 Talk with fellow writers about worthwhile travel journalist’s conferences they’ve attended. I made the mistake, once, of not listening to advice from another writer, and ended up wasting a lot of money on a writing conference full of fluff. Don’t make my mistake. Do your research and make sure the agenda looks exciting and instructive to you. 3. Read the fine print before signing up. Conferences, workshops and events can be expensive. Read the fine print before you sign up for any conference. There are some unscrupulous organizations out there. Be sure you understand registration and hotel cancellation policies. Life happens. Can you get some, or all, of your money back if you need to cancel due to an unexpected emergency at home? 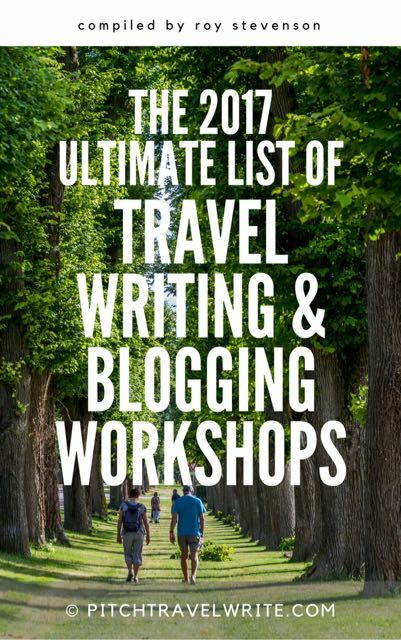 Armed with these suggestions, here are our 2017 Ultimate Listings for Travel Writing Conferences & Workshops, Travel Blogging Conferences, and Other Special Travel Events for writers.